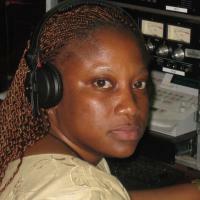 Sharon is a Broadcast Journalist working with the UN Radio in Liberia. The familiarity of the name "Sharon" makes her a celebrity for many Liberians. Sharon has had more then ten years of radio experience dating back at the nation's own Liberia Broadcasting System (LBS). She now produces and presents a number of programs for the UN Radio. The uniqueness of her voice and the sense of humor her programs carry lighten up the day of a lot of people who tune in across the country, as the UN Radio in Liberia has a national coverage. Sharon co - presents a popular early morning show called "Yor Morning" ,also a typical Liberian greeting for that time of the day. One Observer noticed that "her early morning jokes and laughers awaken the country"
Her program touches a wide range of subjects ranging from female empowerment, to tips for the heavy Monrovia traffic.